Just for fun, if you could pick out a seasonal syrup for Starbucks to offer as a summer promotional beverage, what would it be? A long-time reader of this blog went on vacation to Mexico in January this year, visiting Starbucks while he was there. 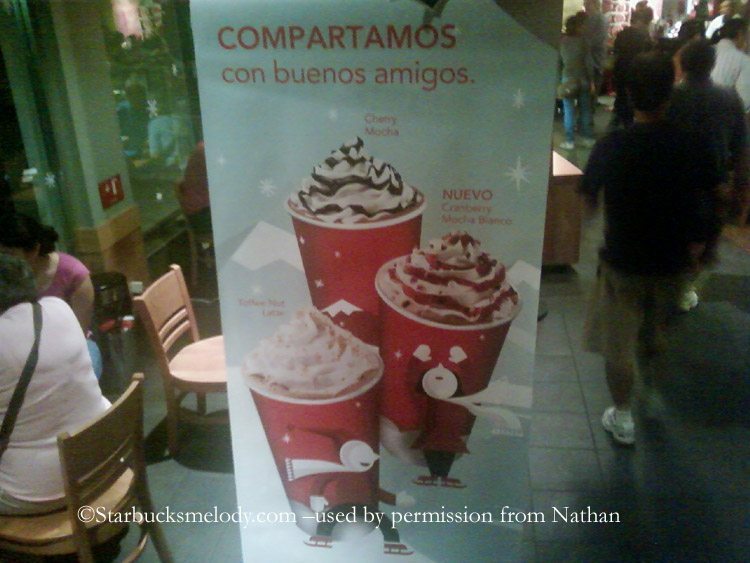 The reader (Nathan, a partner in Canada) discovered that in Starbucks in Mexico, the three promotional holiday beverages were the Cherry Mocha, the White Chocolate Cranberry Mocha, and the Toffee Nut Latte. He sent me a few photos from his vacation, including signs promoting these drinks in the stores. What do my readers think of these ideas? While I understand that Starbucks cannot offer a huge number of syrups due to the logistics of storing numerous bottles, I am ready for a change of pace! I would totally support the idea of Cherry syrup coming back, and while I might not drink many White Chocolate Cranberry Mochas, I would definitely give it a try, and experiment with it in other beverages. Actually, I would like to see Almond make a come back too. 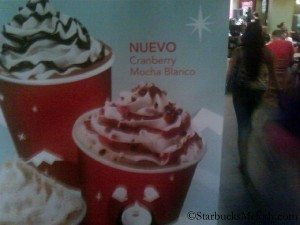 The photos below are obviously from this past Christmas season in Mexico, but it did get me thinking about what customers might want here in the U.S. for the next promotional beverage. Often there are just a couple of promo drinks each year: a holiday promotional beverage, and a summer beverage, and since summer is not far away, I am throwing the question out there: What do you want to see for a summer promo beverage at Starbucks this year? 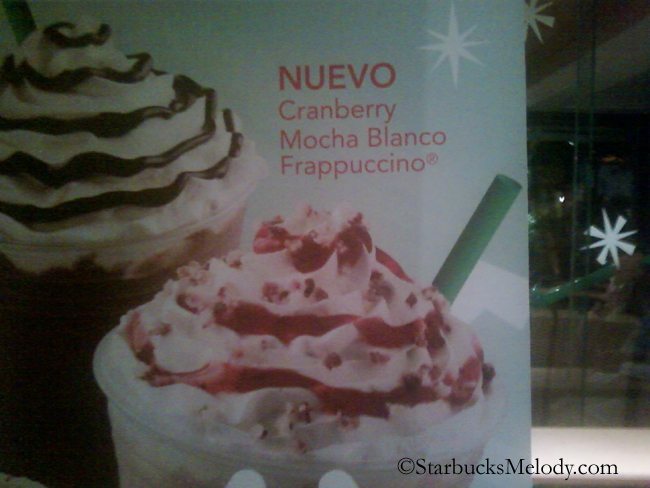 And what do you think of the idea of a Cranberry White Mocha as holiday beverage? Thank you Nathan for sending me these photos! This is an open thread. Feel free to talk about anything Starbucks-related. Starbucks has definitely been in the news lately: They opened their first store in Norway on February 9, 2012; And the green Siren plans to open its first store in India in August of this year; And just so you know, the Rewards department of Starbucks has stated that there are no immediate plans to change the way stars are earned. Also, there is an official Starbucks Google+ page, for those who are interested in Google+. And last but not least, this blog article here has absolutely nothing to do with Starbucks, yet I find the discussion interesting in terms of how brands relate to those folks who hijack their name – either in a positive way or negative way. I guess my interest in that kind of conversation is obvious. Last but not least, I think it would be super fun to get to 1000 Facebook fans, so please “like” the page if you do like it. Thank you to everyone who has been sharing articles via Facebook or Twitter. March 17, 2015: Tribute Blend comes back and more. Should Starbucks introduce the Dark Cherry Mocha to the US? I will see if I can find any information on peach. Sounds exciting!